The adoption of visibility concept has been accelerated rapidly. Here you will learn the basic concept and how you can improve supply chain visibility. "The flow of information, across the supply chain to coordinate supply chain processes"
Articles based on the practitioner's perspective to focus heavily on barcode, EDI, RFID, software system and the connectivity issues. From academic perspectives, visibility is about inter-firm collaboration, information sharing, quality/timeliness/freshness of shared data. Visibility can be diminished by multiple stocking points in the distribution channel. Instead of seeing one figure for one SKU as in centralized distribution, companies with too many stocking points are suffering from multiple data of the same SKU. Then, reducing stocking points is a way to avoid information overload. The prevalent use of outsourcing, global sourcing, in particular, increase the members of the supply chain including related processes. Then, it takes more time for the information to flow from one end of the pipeline to the other end. As a result, people can't understand the whole thing about what happens and where. Shorten the pipeline can be done through the use of intermediaries such as trading companies, international procurement office or even fourth party logistics providers. The key is that the focal company communicates with a "hub" of intermediaries. Another way to shorten the pipeline is to reduce the number of suppliers or supply base reduction. Do you really have to see anything and everything that happens in the supply chain? The answer is NO. 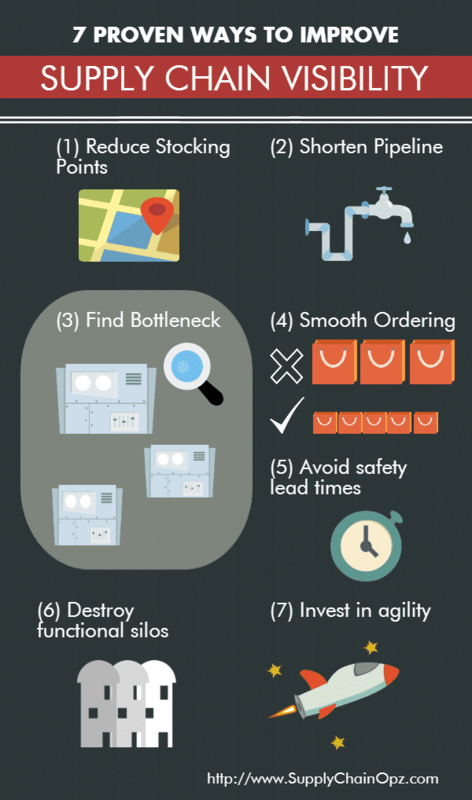 Finding the bottleneck such as production facilities with quality issues or high downtime can save you time and resource to fix the big problems. This principle is based on the bullwhip effect concept. Certain behaviors such as order batching or excessive promotions at the end of the quarter can create the "peak and valley" demand pattern that is difficult for downstream supply chain members to manage. The use of an annual contract or blanket orders will help your supplier manage the demand much easier. The classic symptom of a material planning system is to use "safety lead times" to compensate for lead-time variability. Basically, people add a bit of an extra lead-time to every step of the order cycle. For example, adding 3 days for a possible delay in customs clearance or adding 2 days for extra quality inspection. The result of this is that you can't actually believe the lead-time information in your own enterprise system. People tend to pay attention to certain aspects of data only. For example, procurement people always monitor incoming material closely. When there are problems, procurement people may hesitate to discuss with the production department because they don't want to go outside the departmental wall. Functional silos are then a problem that delays the internal communication and lowers visibility from the inside. The ultimate goal is to make a proper decision quickly. To achieve this goal, companies need to develop a multi-skill workforce, empower employees to make decisions and simplify the internal rules and business processes. Then, an agile organization is something that you should develop. As you can see, the way to create better visibility is centered around the design of your supply chain, internal behaviors, and competency of the internal team. Do you think supply chain visibility is easy to implement and why? - Donington, J. (1995). Electronic Data Interchange in the Automotive Industry: Managing information flows for greater profitability. - Christopher, M., & Peck, H. (2004). Building the resilient supply chain. The international journal of logistics management, 15(2), 1-14. - Christopher, M., & Lee, H. (2004). Mitigating supply chain risk through improved confidence. International journal of physical distribution & logistics management, 34(5), 388-396. - Lee, H. L., Padmanabhan, V., & Whang, S. (1997). The bullwhip effect in supply chains. Sloan management review, 38, 93-102.